I love completely customizing our home with details that make it as functional and beautiful as possible. Here’s a round-up of the web’s best and most practical built-ins. Some are DIY friendly while some require more specialized skills. 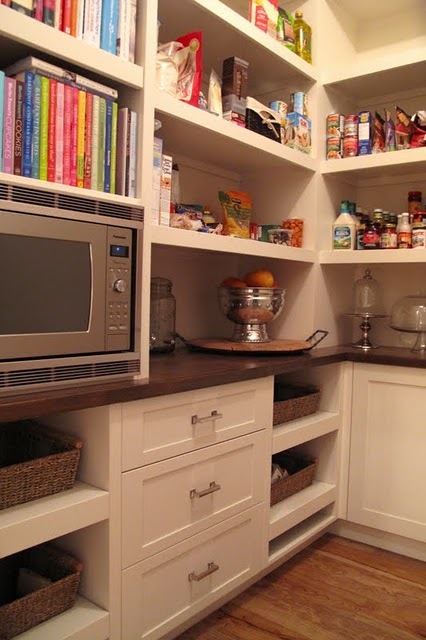 Recessed cubbies puts frequently-used items in a convenient, pretty place. Via notmybeautifulhouse. This built-in dog kennel even has windows and uses an otherwise un-used space. Via Attic Mag. A vertical drawer to hang your pots and pans. Via The Closet Works. A repurposed vintage door makes a clever space-saving spice rack that is also a beautiful display. Via DesignSponge. This ingenious kit stores your ugly-but-necessary toilet accessories neatly between the studs with a nice-looking cabinet door front (that could be further DIYed). Get this DIY kit here. Drying rack drawers! Out of the way except for when you need them. Via Houzz. Create a beautiful, recessed cabinet by re-working a typical linen closet. Via pinterest. A divided baking sheet drawer to help save your sanity is such a simple idea. Via Houzz. Do it yourself with this baking dish organizer. Dog Kennel Cabinet built into the laundry room, with a cute door, of course! Via Pinterest. De-clutter your charging center by moving it into a drawer! Via Houzz. Or, you can at least corral the clutter with a charging station like this one. A lift for your mixer (or other appliances) keeps it out of the way until needed! Via Pinterest. You can purchase this lift on Amazon. I would LOVE to have this built-in silverware divider. So much nicer than the plastic ones + it’s super easy to do! Via Pinterest (originally Flickr). Loving this clever grocery pass-through from the garage straight into the pantry. Via itsforthehome.com. This between-the-studs bath shelving by Sarah Tombaugh is perfect for towels, soaps, and other bath items and was made beautiful with tile and stone. ANGLED storage helps organized those oddly-sized kitchen necessities. Via this old house. This mud room features hidden shoe storage behind hinged panels. Source Unknown.